For a show about the rise of Nazism and the pre-World War II German annexation and occupation of Austria, the characters in The Sound of Music are oddly almost always in good spirits. With such an eminently hummable score, it’s not hard to see why. The cast of Footlight Theatre's The Sound of Music. Photo by Paul H. Wright. While Footlight’s production of Joseph last year was exceedingly average, director and choreographer Lalainia Lindbjerg Strelau has surpassed expectations with The Sound of Music. Lindbjerg Strelau has successfully marshaled an extremely large amateur cast into a strong cohesive production of this family classic. Of course some of that credit must go to Rodgers and Hammerstein for crafting such a feel-good show. Bree Greig’s voice is nearly flawless and she has the youthful and earnest young governess routine down pat. Greig is a very likable Maria and will likely become an even more familiar face to local audiences in short order. Steve Maddock is commanding and stern, as Captain von Trapp ought to be, though the role itself is somewhat of a bore and leaves him little room to maneuver. On the few occasions where Maddock is allowed to sing, it left me wishing for more. Chris Sinosich’s costuming was full of detail as usual and her job couldn’t have been easy given the large cast. That’s not to say that the show was perfect. There were several issues that stood out. The show is fairly long (on the short side of three hours) and the many scene changes took far too long to complete and constantly interrupted the flow of the onstage action. There also should have been more of a buildup to the Nazi threat. The actors on stage never seem to be overly concerned with the looming Nazi occupation and so the dramatic unfurling of swastikas over the audience in the Salzburg festival scene is too much, too quickly. The lighting problems were very noticeable and by no fault of the musicians themselves, the miking of the small orchestra gave it an overly canned feel. Some of the music played during the monotonous scene changes ended up sounding like tinny Muzak. But in the grand scheme of things, these seem like small quibbles; Footlight’s The Sound of Music is a bona fide home-grown success. 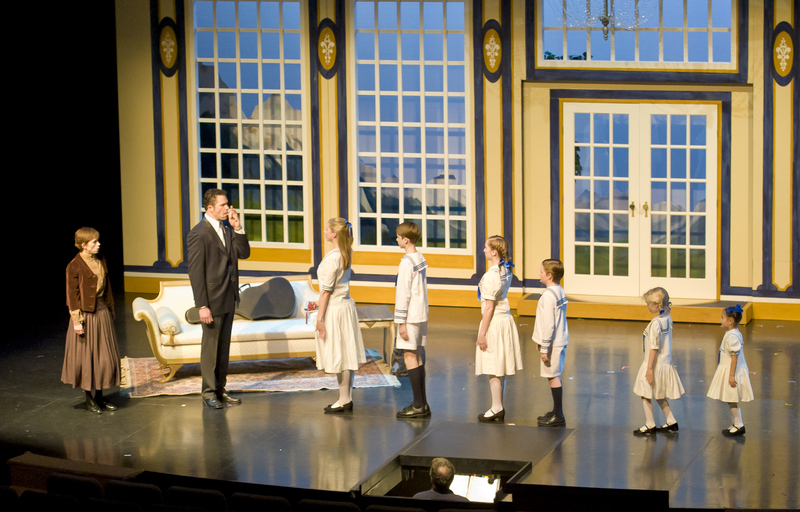 The Sound of Music, presented by Footlight Theatre Company, runs until November 20, 2010, at the Michael J. Fox Theatre, 7373 MacPherson Ave, Burnaby. Tickets are available online or by phone at 604-684-2787. I’ve seen many productions of Joseph and the Amazing Technicolor Dreamcoat over the years; the good, the bad, and the ugly. Footlight Theatre’s production falls somewhere comfortably in the middle. With music by Andrew Lloyd Webber and lyrics by Tim Rice, the family-friendly tuner has become extremely popular with community and school theatre groups. Vancouver is apparently not immune to these charms, as this is the first of three Josephs gracing local stages over the coming year. Based on the Old Testament story, the musical follows dreamer Joseph and his brothers using various styles of music including French ballads, country, calypso and disco. Danny Balkwill (Thoroughly Modern Millie, TUTS) as Joseph has a pop voice well-suited to the title role. He mostly used his instrument to good effect, although in parts his riffing seemed excessive. Bree Greig as the Narrator was off to an auspicious beginning in her Vancouver musical-theatre debut. Her voice has a clear bell-like quality and she carried herself well amongst the large ensemble. David Kemper’s Potiphar was a scene-stealer in his brief appearance and Brad Strelau’s Pharaoh was a credit to cheesy Elvis impersonators everywhere. The children’s chorus sang earnestly under the capable direction of Elaine Lindbjerg and was absolutely precious. Several young stars-in-the making were readily apparent during the children’s solo performances. Live music can make or break a production and the band of Michael Creber, Buff Allen, Miles Black, Dave Ivaz, Kate Stewart and Rene Worst was nearly flawless. Joseph and the Amazing Technicolor Dreamcoat is almost completely sung-through, and it can be difficult for some less-seasoned actors to properly define and develop their characters with little to no spoken dialogue. This ensemble repeatedly fell into that trap and would have benefited from some stronger direction as to acting while singing. This is Footlight’s first time in the larger 600-seat Michael J. Fox Theatre, which is double the audience space of their past venues. Director Lalainia Lindbjerg-Strelau’s Joseph has set them off to a respectable start for what will hopefully be more successful shows down the road. Joseph and the Amazing Technicolor Dreamcoat, presented by Footlight Theatre Company, plays until November 14, 2009, at the Michael J. Fox Theatre, 7373 MacPherson Ave, Burnaby. Tickets are available online or by phone at 604-684-2787.